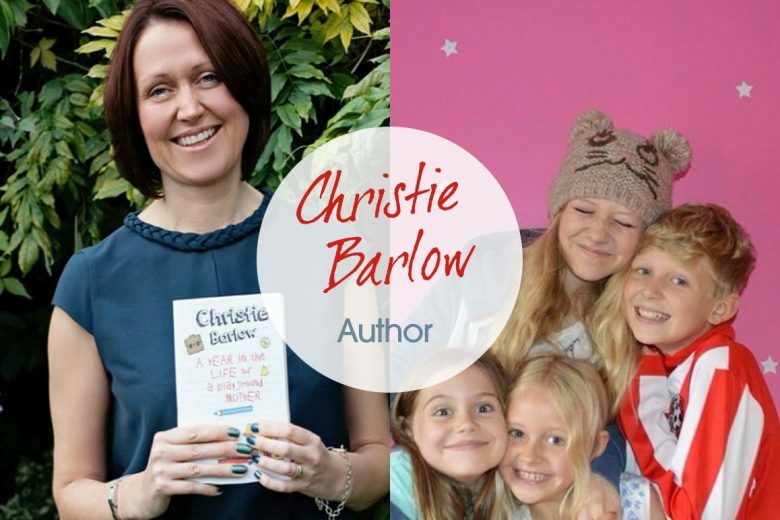 Christie Barlow is a mum of four – and writer of the Amazon bestselling novel A Year in the Life of a Playground Mother. Find out what inspired her to write, and her advice for other aspiring novelists. Hello there! I’m Christie Barlow a 5ft 5 brunette born in the county of Cheshire. Now at the ripe old age of 41 I lead nothing but a glamorous lifestyle, ironing, mucking out chickens and horses and chasing the mad cocker spaniel that usually has pinched my shoes. I’m a mum to four, wife to one and have more animals than the local zoo. From the young age of 19 I had a very successful career in the civil service and worked my way up from a general admin assistant to managing my own job centre. Once I fell pregnant in 1998 and my first child was born in July 1999 my priorities changed overnight, I preferred building Lego houses, baking cakes and days out at the park with my daughter Emily so a career break was decided. We enjoyed our time at home that much that I went on to have three more children – Jack, Ruby and Tilly. My inspiration for this book came from my four children who are all at various stages in their education. This is where I became fascinated with the every day politics and the dynamics of primary school playground mothers. All my four children are completely different, with unique personalities and their quirks. I wanted to show them that no matter what you wanted to do in life if you put your mind to it you were capable of anything. Once hitting my mid-life crisis (but dodging the tattoo and the fast car) after wholly dedicating my life to the care of my children, they asked me what I wanted to do. “I always wanted to write a book,” I found myself answering. And so the idea was born. How long did it take you from the idea stage to writing the actual novel? The book took me 12 months to write – from the initial ideal to the official launch. My book is based purely on comedic scenarios of mothers that occur in everyday life, and as such it’s meant those people reading the diary find it immersive and actually start believing these fictional characters are real, when in fact it’s pure fiction. This just exemplifies my characters and style of writing. My characters aren’t based on specific people but I have drawn on my own experiences and memories. It’s important that I am able to relate to my characters and love who they are – faults as well. I have to enjoy writing the story. You’re a mum of four – when did you find time to write? Every spare minute that I had, I dedicated to writing my book. Even in the middle of the night I would often wake and tap away at my keyboard. The reaction from my family and friends has been a very positive one. They loved the book from the outset and all encouraged me to follow my dream to write it. My husband and four children are extremely proud of my dedication and hard work, especially knowing that I turned my initial idea into reality. The second week of release my book hit the Amazon’s movers and shakers chart at number 11, and it has since reached #1 in the Parent and Family Humour chart and became an Amazon bestseller! I had no idea the response would be so fabulous – I’m just a mum who wrote a book to show her children that anything is possible. My Facebook page is very positive and Twitter followers have been lovely. How did it feel to learn your book was an Amazon bestseller? It was approximately 4.23am when I woke up thirsty and glanced at my phone. The previous night my position was number 8, and I did a double take – I was sure it said number 1. I switched on the light and woke my husband up and asked him to take a look at my screen. When the words “You’re at number 1 left his lips” it felt like Christmas! I was so excited I couldn’t sleep! I jumped on all the children’s beds and gave them massive hugs for encouraging and supporting me every step of the way. I’d written a book, I had promoted my own book via Facebook and Twitter and all my hard work had paid off. And more importantly I have the proudest children ever. I have now spent the last two months in the top 10. You’re currently writing a sequel, when will it be published? I am currently writing the sequel to A Year in the Life of a Playground Mother and this will be ready to be released in the spring of 2015. My advice would be to go for it – anything is possible. We all have self doubts when writing, but keep going and believe in yourself. Write a little every day, that way there will always be continuity, and make sure you read lots of different varieties of books (and always find time to read). Just remember you can’t please all of the people all of the time and some people will not like what you have written. Don’t feed their negativity – a dignified silence is the best response. These people do not matter. Surround yourself instead with positive people and those that believe in you and love your work. And remember, it is better to create and be criticised than to create nothing and criticise others. You can find A Year in the Life of a Playground Mother on Amazon.